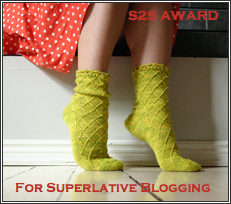 So, since I've been a bad blogger and not posted in over a week, therefore not awarding anyone the prestigious S2S Award: For Superlative Blogging last week, this person technically gets it for two weeks in a row. Does that make sense? It may not. It may just be my futile attempt at making myself feel better for falling off the bloggin' wagon over the holidays. Anyway, I digress, enough about me. This person is someone who I look forward to reading about every day. They crack me up, and make me wish I was as inherently funny and didn't have to try so damn hard. I heart Pearl. With all my heart. I am excited to check her out, thanks Sassy. And congratulations to Pearl! Man, I was getting worried there.